Every volume of Science Comics offers a complete introduction to a particular topic—dinosaurs, coral reefs, the solar system, volcanoes, bats, flying machines, and many more. These gorgeously illustrated graphic novels offer wildly entertaining views of their subjects. Whether you're a fourth grader doing a natural science unit at school or a thirty-year-old with a secret passion for airplanes, these books are for you! 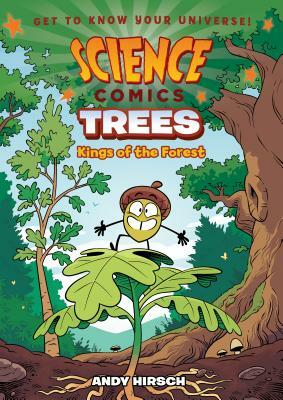 In Trees: Kings of the Forest we follow an acorn as it learns about its future as Earth's largest, longest-living plant. Starting with the seed's germination, we learn about each stage until the tree's maturation, different types of trees, and the roles trees take on in our ecosystem. Andy Hirsch is a cartoonist and illustrator living in Dallas, Texas. The third of four children, he was born in Minnesota, migrated to Texas at a young age, and studied comics in Savannah, Georgia. He previously illustrated the graphic novel The Royal Historian of Oz, which was listed as a 2013 YALSA Great Graphic Novel for Teens, and has contributed to the Garfield, Regular Show, Adventure Time, and Peanuts comic book series.